Whether his story is true or not, Stiffy Green is the most beloved bulldog in all of Indiana. Located in the Vigo County Historical Society Museum is a dog. He’s a bulldog, although he’s seen better days. His fur appears dusty and rotten, and he has one sparkling green glass eye and one shattered one. Modeled after the labyrinth in Chartres Cathedral, this small-town Indiana memorial labyrinth sits half a world away. In an alley not far from where two great highways meet, byways of a very different sort are honored. 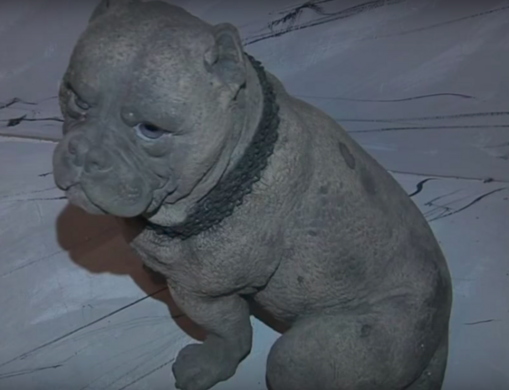 This dog, lovingly referred to as Stiffy Green, is made of cement, and used to be a porch decoration belonging to John Heinl, a philanthropist. At least, that is the opinion held by the director of Historical Society. According to just about any resident of Terre Haute, Indiana, Stiffy was a real, living dog. 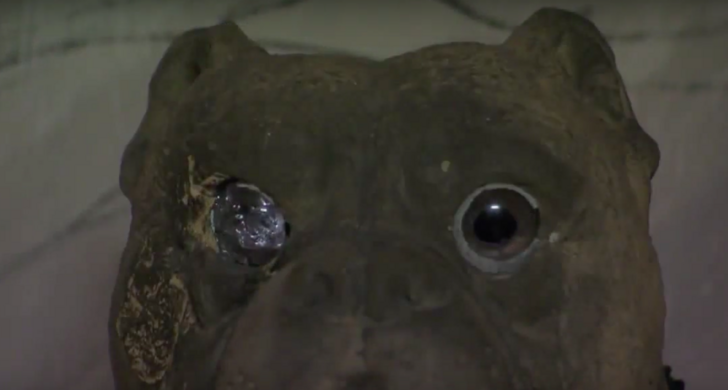 According to Terre Haute legend, Stiffy the bulldog was devastated when his beloved owner died in 1921. Stiffy refused to leave his side, and kept running away to Highland Lawn Cemetery to sit inside Heinl’s mausoleum. He would repeatedly return to the site of his owner’s grave, growling and barking at anyone who he deemed to be a threat. One day, Stiffy was found dead on the steps outside the mausoleum. In an attempt to honor the dedicated dog, he was stuffed and his eyes, which were a vibrant green, were replaced with glass replicas. His body was placed inside the tomb with his owner. Before long, it became a Terre Haute tradition to visit Stiffy on dark nights, and shine a flashlight his way to see his eyes sparkle. Rumor has it that some people even saw the ghosts of Heinl and Stiffy taking a walk through the cemetery at night. 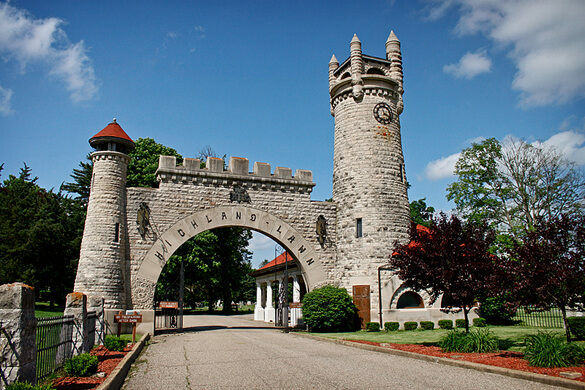 During the early 1980s, shots were fired in the cemetery by vandals. The bullets damaged part of Stiffy’s head and busted one of his eyes. 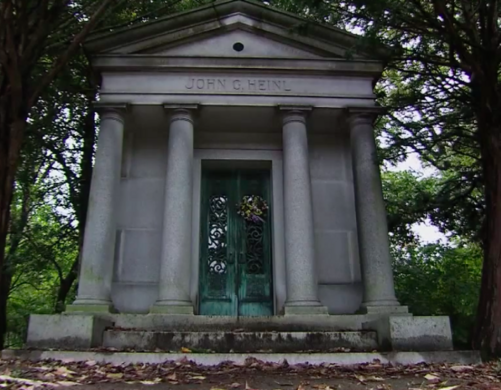 Heinl’s living relatives removed Stiffy from the mausoleum in order to protect him, and donated him to the Historical Society, where he has resided since 1989. Whether he is made of cement or of bones and flesh, it doesn’t really matter. Stiffy Green has served as a symbol for Terre Haute, Indiana for centuries, and he’s not going away. to China, Everglades, Florida, Borrego Springs, CA, and more. A wartime promise becomes a shrine to Our Lady of Lourdes. In a grove of fast growing walnut trees outside Paris, Illinois, a marker shares part of the largely forgotten history of the fictional Kcymaerxthaere's road building culture. This quaint stretch of road is the final resting place for hundreds of America's four-legged veterans. The burial place of some of Mexico's most prominent residents is full of macabre stories and hidden masonic symbols. Dogs, cats, horses, monkeys, frogs, and fish are laid to rest at the second-oldest pet cemetery in the U.S.
Canada's first pet cemetery is now abandoned.